My eyes have resisted ‘normal’ all my life. As a result, I have had a pair of spectacles on my nose as long as my memory stretches. These orderly-defiant eyes also require the annual visit to the experts who have to be convinced that I really cannot see those damn minuscule letters projected on the wall. At a recent visit, I was informed that I again needed new glasses … so here I am a couple of weeks later with an incandescent purple pair and, yes, the world has come back into focus. Those of us who are part of the spherical spectacle syndicate will appreciate that any new pair of glasses requires a relationship with patience and adjustment. It’s overwhelming to suddenly see that clearly! I think one of the secret joys of all optometrists is to have that moment where they put a contraption on your nose and say, ‘This is your old prescription’, then a few clicks and glass slide shuffles later and, ‘Voila! Your new prescription’. Gets me every time. Yes, ok, you win, I needed new glasses! It’s not just my physical eyes that need new glasses. I have found that my way of looking at the world needs a good dose of challenge and deconstruction if I want to live congruent with the values and ethics that are important to me. A habit has a way of petrifying our minds. When we mix habit with the notion that our ideas should not be tested because they are somehow sacred or certain, we may find that smugness, not kindness, informs our lives. As 2018 begins to wind down, I take time to reflect on a rather grueling year. It has been a year of saying more goodbyes, moving house, facing illness, and completing a Masters in Narrative Therapy and Community Work through Dulwich Centre and Melbourne University. It is this masters that has shaken my life up. It has provided me with a new pair of spectacles. 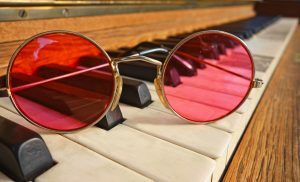 My focus has been adjusted and, like any new glasses, has sometimes made me feel quite queasy as it provokes deeply embedded ways of thinking with the question, ‘Why’? I have discovered that assumption has had a part to play in diminishing the voice of curiosity in my life. And I am not okay with that! As 2019 is now only a few weeks away I am beginning a new chant … Viva la Curiosity! Friend, how are your eyes? Do you still find their focus meaningful? Is there a niggling doubt about the spectacles you have been prescribed as one-size-fits-all? Is it time to get a second opinion? Maybe your own opinion as the expert optometrist of your life and views? Is it time to challenge some old assumptions and prejudices? I hope that 2019 will be filled with some new friends … and if curiosity and wonder are precious to you … remember to put out the welcome mat! Fennel was a regular star in the meals consumed in my childhood. To this day I can identify it blindfolded, simply by its unique, slightly sweet taste. It is also somewhat of a divisive culinary accompaniment, a bit like coriander. People such as my parents and grandparents were devoted to this humble vegetable, while others refuse to allow it anywhere near their kitchen. But there was one historical figure who swore by fennel – and her love affair was recorded in the annals of history. In the fertile, temperate Rhine valley, near the River Main, a convent of Benedictine nuns became the focal point of many religious devotees in the Twelfth Century. 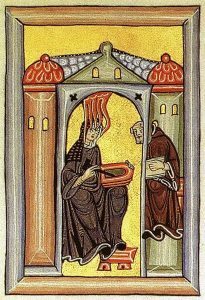 Hildegard of Bingen (1098-1179) remains somewhat of an historical phenomenon to this day. 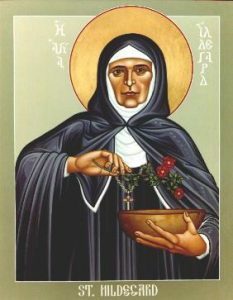 Her many visions and knowledge about the meaning of Scripture drew the attention of people such as St. Bernard of Clairvaux and the Pope himself, Eugenius (1145-1153), who read her writings to a synod held in the German city of Trier. It did not take long for the news to circulate that a prophetess was living in Disibodenberg. You can read more about her remarkable life here. – For puffy eyes, place 2 tsp of roasted fennel seeds or ground fennel seeds in hot water, let steep for 5 minutes or more. Once cool enough to touch, dip the corner of a folded paper towel in the solution and apply to the under eye region. 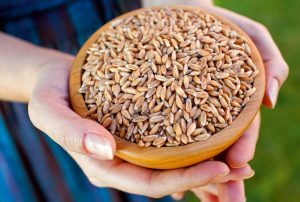 – For weight loss, steep 1/2 tsp roasted fennel seeds in warm water and drink twice a day. – For a cold, drink warm fennel tea 2-3 times a day. – For heartburn, bloating and gas, eat a pinch of roasted fennel seeds immediately following a meal. Fennel belongs to the Umbellifereae family, second cousin to parsley, carrots, dill and coriander. It contains a unique combination of phyto-nutrients that allow for strong antioxidant activity. Research has found that one of it’s most interesting phyto-nutrient compounds is anethole. Anethole has reduced inflammation and prevented the occurrence of cancer. It has shown to be able to protect the liver from toxic chemical injury. 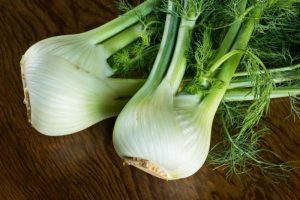 The high Vitamin C content in the fennel bulb is anti-microbial and needed for the proper function of the immune system. It is also a great source of fiber, folate and potassium. Fennel has also been called the pearl of aphrodisiacs. A recent concoction of fennel seeds, liquorice root and water was named the ‘tonic for happy lovers’ (yes, I know, you will all rush to brew this now!!). It holds benefits for lungs, liver, pancreas, spleen, kidneys and to help dissolve kidney stones. One of its main historic uses was to cure issues surrounding indigestion. In short – fennel is fantastic! Why aren’t we all in love fennel?! I find it surprising how many people shake their heads at things they have never tried. Over the years we have had countless people around our dinner table. Herbs and vegetables have been the ones regarded with the greatest suspicion by many. 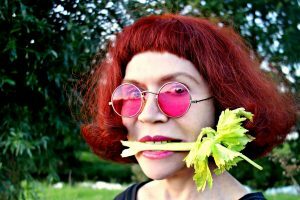 Of course, I understand that once tasted some may decline delicious vegetables or salads because of poorly-evolved, artificially-sabotaged taste buds, but at least give it a go. Shock horror – it may even improve your health! You may never develop a love affair with fennel like Hildegard did. However, you could discover in fennel a friend that has been sent to make you feel happy! Here is to health, and cheers to a beautiful earth that graciously shares with us her fennel friend.